(Nanowerk News) It looks like a Slinky suspended in motion. Yet this photonics advancement – called a metamaterial hyperlens – doesn’t climb down stairs. Described in a research paper published today by the journal Nature Communications ("Experimental demonstration of a non-resonant hyperlens in the visible spectral range"), the hyperlens may someday help detect some of the most lethal forms of cancer. 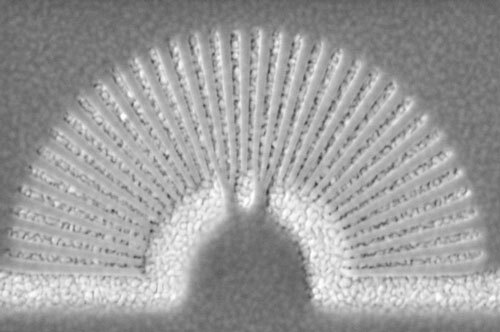 The image shows a metamaterial hyperlens. The light-colored slivers are gold and the darker ones are PMMA (a transparent thermoplastic). Light passes through the hyperlens improving the resolution of very small objects. “There is a great need in health care, nanotechnology and other areas to improve our ability to see tiny objects that elude even the most powerful optical systems. The hyperlens we are developing is, potentially, a giant step toward solving this problem,” says Natalia Litchinitser, PhD, professor of electrical engineering at the University at Buffalo and the paper’s lead author. Diffraction sets a fundamental limit to the resolution of optical systems. Scientists are working to solve diffraction with metamaterials, which are materials engineered to have properties not yet discovered in nature. Typically, the materials are arranged in repetitive patterns, often smaller in scale than the wavelengths of the phenomena they influence.